'Broken' episode guide: what happens next? ‘Broken’ episode guide: what happens next? Posted May 23, 2017 by John Moore & filed under Episode guides. 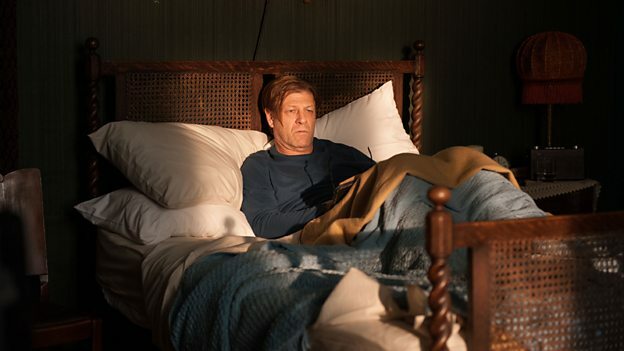 Sean Bean will star alongside Anna Friel in Jimmy McGovern’s new six-part drama, Broken. The series begins on BBC One on May 23rd, at 9pm. Here’s our episode guide. After mass, Father Michael meets Christina Fitzsimmons (Anna Friel), a mother of three who works at the local betting shop, and is saving money for her daughter’s First Communion. However, when her attendance in Church sparks an unfortunate chain of events, she is left with no way to feed her children and keep a roof over their heads. Pushed to the edge when tragedy strikes, Christina makes a desperate plan to alleviate her situation. Will she go through with it, or can Father Michael – suspicious that all may not be as it seems – offer the family a lifeline? Elsewhere, Father Michael visits his mother and brothers, sparking memories of his childhood, and revealing that he is a man with secret struggles of his own. As the repercussions of Christina’s actions start to hit home, Father Michael makes a discovery and must act fast to help Christina justify what happened to the authorities and her sister Mariella (Clare Calbraith). A new parishioner, Roz (Paula Malcomson) attends Confession to share a huge secret, prompting the priest to share a dark confession of his own in an attempt to dissuade her from the desperate course of action she has planned. The two share a connection, but is it wise for Father Michael to confide his own secrets to someone struggling to deal with their own? Elsewhere Helen Oyenusi (Muna Otaru), one of Father Michael’s most devoted parishioners, has a crisis when her 18 year-old son Vernon (Jerome Holder) cannot adapt to home life following his discharge from the specialist care unit where he was receiving treatment for paranoid schizophrenia. Will Father Michael be there for them when they need him most?